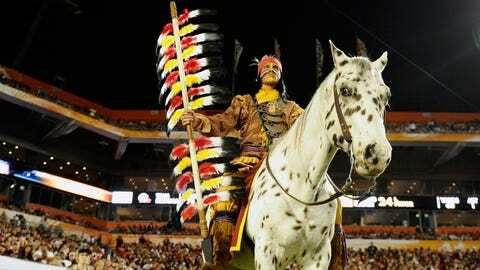 Florida State Seminoles mascot Chief Osceola and his horse Renegade pose for a photo in the second quarter of the game against the Northern Illinois Huskies at the 2013 Orange Bowl. NEWPORT BEACH, Calif. (AP) — A student sitting atop a speckled Appaloosa and wearing a headdress and war paint will ride to the 30-yard line before the BCS title game and plant a flaming spear into the turf. "The relationship is treated with reverence," said Liz Maryanski, Florida State’s vice president for university relations. "We are very respectful of them and we honor them because they, frankly, allow us to use their name." The university, in fact, refuses to call the horse and rider its mascots, choosing instead to call them symbols of the Seminole that represents the school’s sports teams. The No. 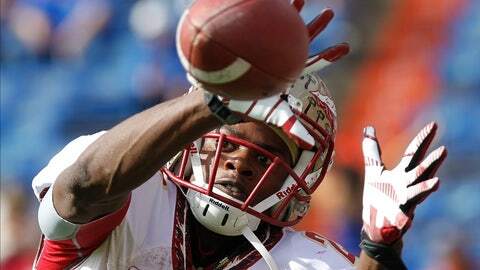 1 Seminoles were built using the recruiting classes of 2010 and 2011. "Anybody come here into Florida trying to tell us to change the name, they better go someplace else, because we’re not changing the name," Billie said. The nickname "Seminoles" has been in place at Florida State since 1947 and the tradition of Osceola, the rider, and Renegade, the horse, dates to 1978 when a student on horseback led the football team out of the tunnel before a game against Oklahoma State. The school refuses to use them for more "traditional" mascot activities such as cheerleading or promotional appearances. Florida State’s decision to stick with the Seminole nickname counters a trend that started in 1972, when Stanford changed its nickname from Indians to Cardinal. That sparked a number of other universities with Native American nicknames to consider similar changes. Some did, while others stuck with their names. Among them, the Utah Utes, who have a red-tailed hawk as their mascot, and North Dakota, where they held onto "Fighting Sioux" until 2012, when more than two-thirds of voters in a statewide election cast ballots to dump the nickname. And, of course, Florida State, where "Seminoles," along with Osceola and Renegade, remain a central part of the football tradition. Osceola’s outfit and makeup have been adjusted with input from the tribe, as the school, which once had a cartoonish mascot named "Sammy Seminole," has sought a more respectful portrayal of its symbols. Meanwhile, Florida State fans are given wide credit for starting the "Tomahawk Chop" and the accompanying "war chant" that have become common at home games involving teams with Native American nicknames. Patricia Wickman, an expert on Native American history and culture who advised Florida State when it changed the look of the horse and rider, said whatever adjustments were made don’t make them historically correct. Native Americans in the Southeastern United States were largely hemmed in by water and didn’t have much use for horses. "Horses in swamps, they don’t do so well," she said. But even if the horse and rider were historically accurate, in her view, using it the way Florida State does is still far from politically correct. "I think it’s profoundly insulting," she said. "I think the time when non-Indians in this country could co-opt images with impunity is long over." In 2005, the NCAA voted to ban schools that used "hostile and abusive" logos from the postseason. Florida State was exempted from that ban in part because of its unique relationship with the Seminole Tribe of Florida. When the tribe and university were negotiating an agreement, Wickman urged the tribe to try to get a small portion of the proceeds from souvineer sales. But the tribe wasn’t in it for that sort of gain. Instead, Florida State helps schools on the tribe’s reservation, which has a population of more than 3,000, and also offers full scholarships to tribal members who attend the university. The Seminole Tribe also sponsors the annual Bobby Bowden Award, given to a football player who demonstrates excellence on the field and in the classroom and community. Sanchez was on hand to present the award earlier this week. "To have that kind of connection means a lot more than just use of the name," said Gary Bitner, who does public-relations work for the tribe. Meanwhile, protests and complaints are rare at Florida State. Maryanski said an occasional letter may come into the president’s office; the response usually starts with a careful explanation of the close relationship the university has cultivated with the tribe. "We explain the richness of the tradition and how we respect their traditions," she said. "Once people understand the relationship, that goes a long way." Though Wickman disagrees with using the Seminole as a mascot, she said her view is far from unanimous, even on the reservations across America. "When an entity such as FSU does as well as FSU is doing, they’re glad to see their own name carried forward successfully," she said. "I know it’s not right, politically, as far as the Indian world is concerned. But there’s no such thing as a corporate world view anywhere in the Indian world."